give "personhood" to a new corporatocracy. "... corporations have no consciences, no beliefs, no feelings, no thoughts, no desires. members of 'We the People' by whom and for whom our Constitution was established." in which they held stock in companies interested in the outcomes. 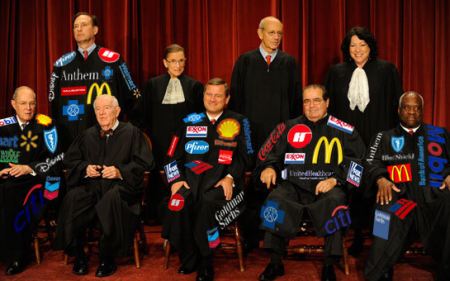 Up in arms about the huge gift the Supreme Court just presented to the powerful and wealthy? monitor and maintain Big Business Collusion for monopoly of Big Government? anything else that could reduce corporate profit. But the mainstream media are mysteriously silent. "The Internet! The Internet? Ask them about the Internet in China. if you don't even know it happened?" You could see it coming if you had your eyes wide open. Corporate war profiteering in the U.S. now spends more on endless war “defense” (call it empire) than all countries of the world combined. Big Pharma’s monopoly on “disease treatment” (call it health care) clears more profit than 90% of the Dow Jones Industrials combined. Since the public doesn’t want to support war and disease profiteering with their taxes and sickness, there is an obvious conflict of interest. This conflict of interest between moneyed power and public consent is the real cause of the healing crisis in America -- all the dysfunction, discontent and demoralization that a disgusted public now sees as we are further dis-empowered by privatized (corporatized) policies causing disconnect and division within the "State of the Union". an individual, by a group, or any controlling private power." The cause of this healing crisis may first appear as the mental dis-ease that continues stupid public policies yet expects "change" of a redeeming social nature. But the root cause behind this systemic insanity is the spiritual dis-ease which calls evil “good”, destroying the fabric of civility like a systemic cancer in the body politic. like a physician diagnosing some deep disease." What we now see folks is the eternal struggle between evil and good, tyranny and freedom, the love of power and the power of love… rising to the surface like an ugly boil on the face of the Republic. You could treat the surface symptoms of this deep dis-ease, lancing the boil and draining “the puss” by voting in new public reps. 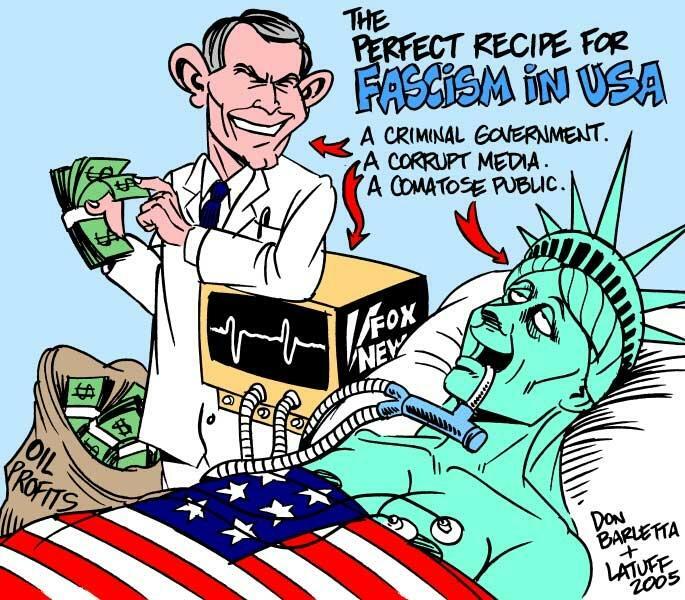 But the systemic infection in the body politic would just create new boils, and now faster than ever since the Supreme Court’s law of the land has sanctioned this infection on demand – the demand of corporatocracy. Mark my words, 2015 is a flash-point for mass awakening to global problems and global solutions. The crisis in America is now at an exact parallel to the Revolutionary War, but now it is a global issue that will define and refine a Net reality upgrade of core Constitutional freedoms. The whole world is watching – global Netizens in our new instant-everywhere global village – and the Family of Mankind wants only to see the decentralized grassroots (Net roots) consent of the governed check and balance the inordinate love of power infecting the rights of all mankind. “The cause of America is in a great measure the cause of all mankind. A new Common Sense is emerging with our new Net reality. People worldwide know that breakthrough energy technologies could liberate humanity from Big Oil’s monopoly that is poisoning our planet’s life support systems. Breakthrough healing technologies could likewise heal our bodies from the systemic poisoning by Big Pharma’s toxic genetic-mutating drugs. But most important for resolving the current crisis is the healing of spiritual and mental dis-ease -- a new enlightenment via the breakthrough interactive capability of the Internet to upgrade horse-and-buggy representation systems with a global Space Age reboot of core Constitutional freedoms. as would now rally to demand a global rEVOLUTION in higher consciousness. deserves the love and thanks of man and woman." This is the point that global rEVOLUTION now finds us - the 2015 Turning Point. To claim the victory now is simply to seize the opportunity to focus attention with pure attention on the evolutionary ascension of the Family of Mankind in our global village. Networking for the Net worth of Net reality. There is no stopping the Aquarian Dispensation as the veil thins at an accelerated rate through to the end of the world as we have known it. The only question is who will ride that REAL change wave for a New Beginning -- a New Enlightenment as will culture a New Common Sense of, by and for the Power of Love at the heart of our divine destiny - The Emerging Blueprint for a Golden Age.